Let's analyze your market and choose the right dissemination platforms – launching content that is both engaging and accessible to your prospective students. Recruiting students from around the world can pose a variety of challenges. Cultural differences aside, barriers to technology can keep your outreach efforts from ever reaching your target audience. From evaluating the various pipeline options to figuring out what differentiates your institution from the rest, we will help you analyze the opportunities, present your team with options and implement solutions that fit your unique goals. 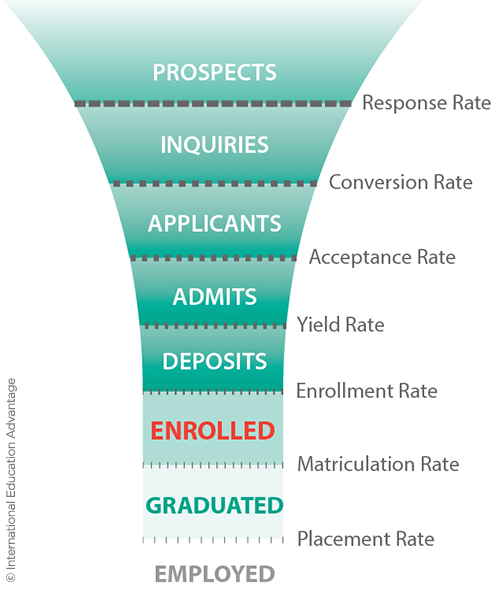 We understand the recruitment funnel and will help you evaluate how your institution can move students all the way to “employed” following graduation. With that kind of result, your institution’s reputation will continue to build on itself. We are mindful of the limited resources available for these kinds of initiatives. The most successful efforts to expand and diversify your international student population will start with a clear directive. With a clear vision and solid grasp of the value of international student education, your institution can move forward with more unity and more resources. Tapping into the international network represented by your colleagues is just one way to expand your reach to new markets. These connections can open doors that might otherwise be shut. Yet these are small steps. There are other avenues that require more significant investment and offer greater potential to create more steady streams of students. Should you partner with an ESL outfit or build your own ESL program? Would a 1+3 pathway program work for you? Can virtual fairs bring in more students? Or does a physical presence at college fairs overseas provide a greater return on investment? Do Hobsons or IDP provide the kind of services that can move the needle for your institution? How should your institution approach the controversy over using paid international agents? What kind of analytics are worth tracking to maintain success and justify budget? All of these questions, and others, are being asked and answered at schools across the country. With so many avenues to consider, we believe it is wise to weigh the options and the culture within your institution before throwing resources at any particular recruitment program.